Sometimes your users tell you that you're doing the wrong thing. I was originally tasked to investigate the Search functionality of EMC-Legato's messaging software. The search had been designed to be used by IT administrators to help people recover lost emails and IMs. Talking to users revealed that the software was being used by compliance and legal discovery people, who found the tool frustrating and a mismatch to their needs. The user complaint about "search doesn't work" was actually a complaint that "you don't understand and support our work goals." Through user interviews and secondary sources I assembled a set of goals and tasks the software needed to support. I then produced a complete new product design targeting these users and use cases. We iteratively refined the design by showing mock-ups and workflows to potential users and gathering feedback. 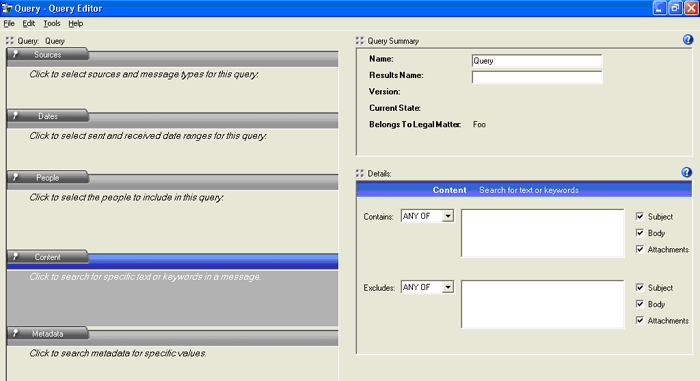 Legal Discovery Manager (LDM) was designed as a new client front end to the EmailXtender line of products. It presents a case-management framework for legal matters supporting discovery and retrieval of significant messaging records. the Case Room, a way to organize the vast amounts of data investigators need to handle. the Query Editor, a re-thinking of how people need to write search queries for legal investigations rather than for IT work. 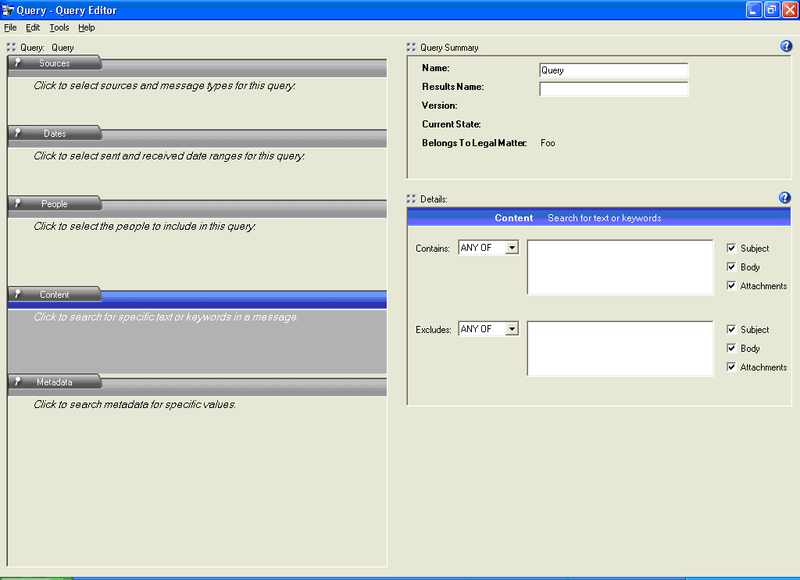 the Matter Manager, an overview tool based on user categorization (taxonomy). Users told us they think in terms of "cases" or "legal matters", many of which are similar. The main screen for interaction is a Matter Case Room that emphasizes key details about the case and that gives summary access to the key elements of a case: imports, queries, and exports. Legal matters can run for years and accumulate large amounts of data. Presenting small but expandable lists permitted easier scanning and sorting while giving users confidence their data had not been lost — a significant problem in the old system. Queries are the heart of a case. 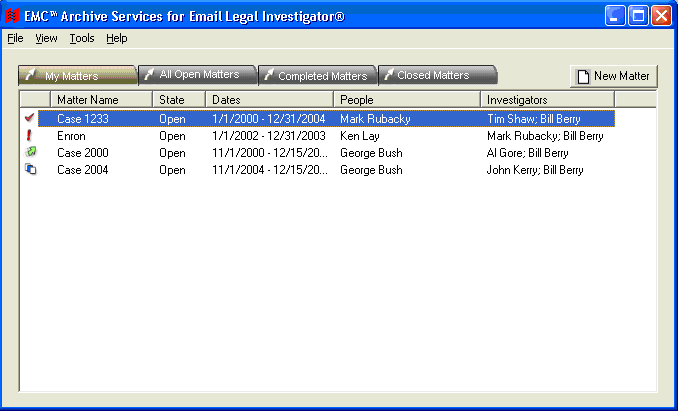 Users' major complaints with the previous IT-focused query tool were that it did not support the kind and complexity of queries legal investigators needed. I found that queries were often run by personnel with no or little legal training, who then turned the results over to lawyers. The UI needed to support very clear direction for untrained users, as well as concise summaries of queries for supervisor review. Finally, observing users' work showed that they did not organize cases primarily by metadata such as name. Rather, they first grouped them according to their status — Do I own this? Is the matter open or closed? 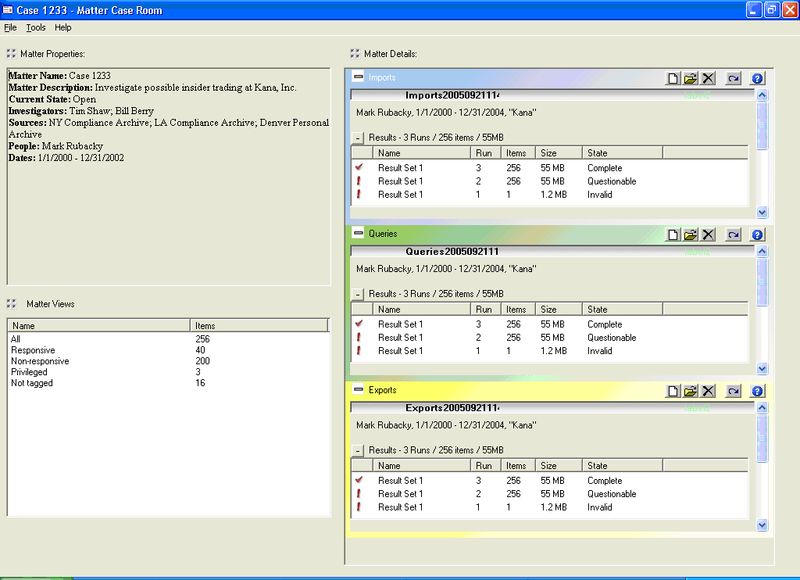 To support this we designed a quick-access Matter List Manager that supported review of matters by user-centric overlapping categories, sorting and searching by key case properties, and one-button access to the Matter Case Room (shown above) for any chosen case.